If you have a great cut of meat, there is no need to do much with it. Add the meat to heat, then add a little salsa to go with it! Quick. Simple. Savoury. • Get large skillet on high heat until smoking. • Cut elk backstrap (or other lean cut: tenderloin, leg) into ¾ inch steaks. Season thoroughly with salt and pepper. • Good 2 second glug olive oil into pan, and then add elk steak. Leave to cook approximately 4 minutes on one side until well-browned. • Flip the steak and continue to cook another 4 minutes. Add more oil if needed. • Salsa Verde: If using an immersion blender, place following ingredients into a high-rimmed bowl. Or place all ingredients into a blender: 2 bunches parsley, 1 bunch mint, 1 teaspoon Dijon mustard, 1 tablsepoon capers, 4 anchovy fillets, 2 cloves garlic, ¼ cup canola oil. Blend until combined. While blending, drizzle in ⅓ cup olive oil. If needed, add a splash of water to reach a consistency that is spoon-able. 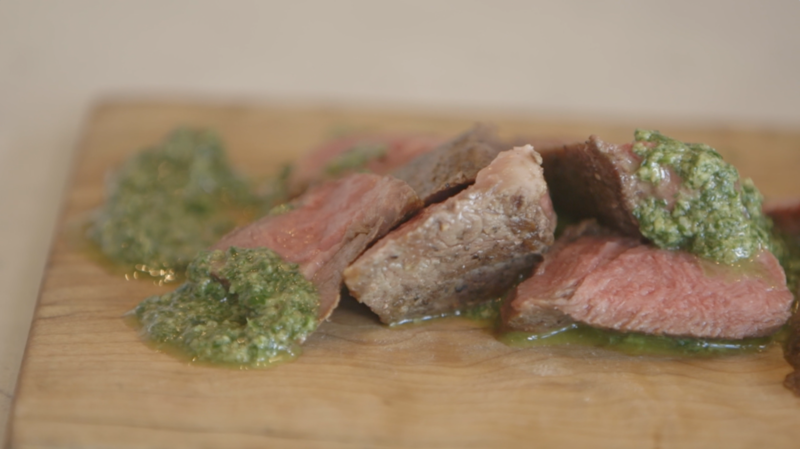 • Slice steak against grain, and spoon over salsa verde.